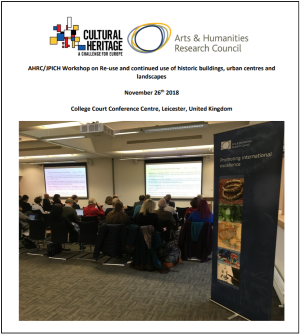 As part of the Joint Programming Initiative on Cultural Heritage and Global Change (JPICH), a free workshop on the Re-use and continued use of historic buildings, urban centres and landscapes was held in Leicester in November 2018. The workshop provided the opportunity to showcase current research in the sub themes of Conservation and Planning, Diversity and Communities, Immersive, multi-sensory engagement and virtual reality and Contested Heritage. The workshop was also designed to act as a platform to generate discussion and thoughts about the long-term strategy of the Joint Programming Initiative on Cultural Heritage- jpi-culturalheritage.eu. Since 2010, 20 EU participating countries and 8 observer countries have participated in 4 transnational joint funding calls with the most recent being on Digital Heritage and Heritage in Changing Environments. There are further calls planned for 2019 and 2020. To provide a platform to facilitate discussion about the long term strategy for the JPICH. To focus discussion around past, current and potential research into the Re-use and continued use of historic buildings, urban centres and landscapes. To bring together heritage researchers and stakeholders in the 2018 European Year of Cultural Heritage. To raise awareness of AHRC’s Heritage priority area. This report provides a summary of the presentations and discussion from the workshop.